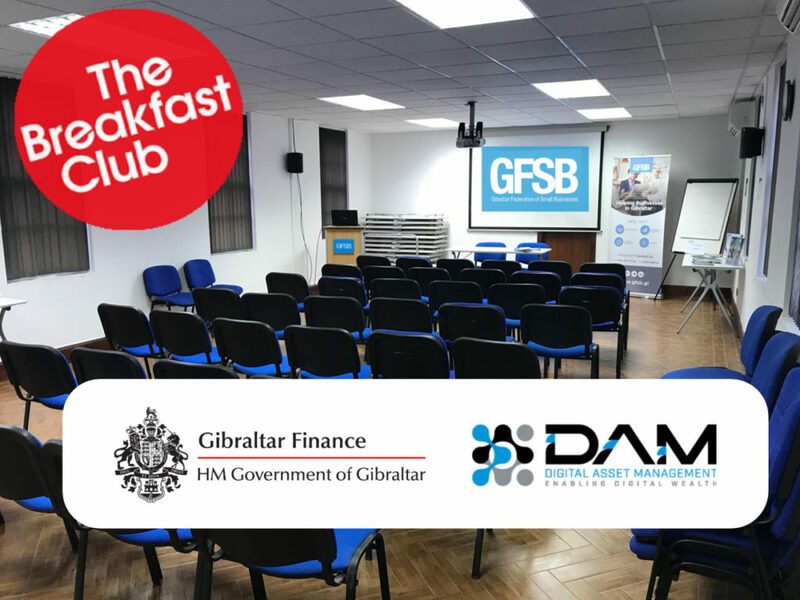 The GFSB is a non-profit organisation that exists to help small businesses in Gibraltar to start, grow and thrive. We represent the business community and pressure Government on our members behalf. 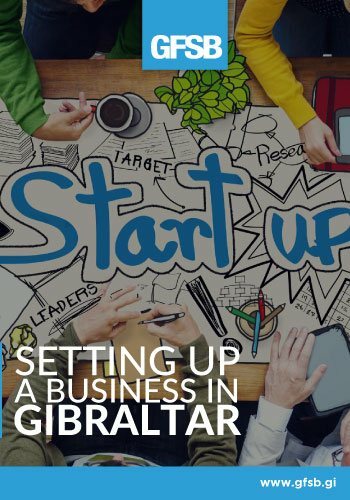 If you run or are starting a business in Gibraltar you should consider joining us. 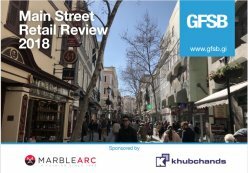 Read the Main Street review for 2018. 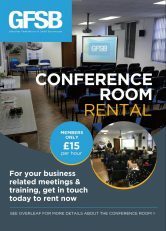 For your business related meetings & training, get in touch today and rent now. A key part of our service is offering our members excellent opportunities to network. With our regular speed networking events and our breakfast clubs, getting your business known is easy. Starting and running a business can be challenging we are here to help you with practical advice and support to make sure that you have all the knowledge you need to give you the best chance of success. We have a growing discount scheme. The goal is to aid companies to do business with each other at reduced rates. We are continually holding events for our members. From our informative and interactive breakfast clubs to our training sessions. 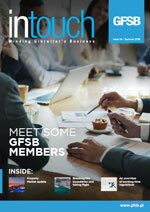 GFSB Events are a great place to network and grow your business contacts. The GFSB Innovation Awards further promotes quality standards, business improvement, innovation and achievement for its members. We offer regular subsidised training on a large variety of topics. Save 40-50% on regular costs of training in Gibraltar. We represent Gibraltar businesses on many Boards, we apply pressure on the Government to try to get the best deals we can and can help you solve a great deal of business issues. Directors Naydan Porro and David Martinez picked up their award for Hempassion which produces a range of CBD dietary supplements. Brexit was the word on everyone’s lips at the GFSB’s Annual Gala Dinner in March this year. As members gathered at the bar of the Rock Hotel’s Khaima Restaurant making the most of a pleasant if chilly evening, news was just filtering through that the EU had agreed to the British Prime Minister’s request for an extension to the Brexit deadline. There was a caveat, of course, that the so-called ‘third meaningful vote’ to be taken by MPs at the House of Commons the following week agreed the Withdrawal Agreement negotiated by Mrs May with the EU. Another development in the chaos that is Brexit, in the eyes, it appeared, of Gibraltar’s business community. Or, as Gibraltar’s Chief Minister, Fabian Picardo aptly put it in his keynote speech to members, “Gibraltar is like a cork in a storm at sea rather than an aircraft carrier.” The storm, he continued, having noted how it has been widely observed that negotiating with the EU always goes to the wire, is now at its zenith, but while aircraft carriers may struggle in a violent swell, corks float, and thus is Gibraltar likely to emerge from Brexit: still afloat, wet, perhaps, but ready to sail on. The GFSB’s Annual Gala Dinner was an ideal opportunity to hear the most up to date news on the issue of Brexit and how this might affect Gibraltar, and it had been hoped that with only eight days to go to 29th March (the date originally set for UK and Gibraltar’s withdrawal from the EU) that Mr Picardo might have some additional detail on what withdrawal arrangements had been agreed. 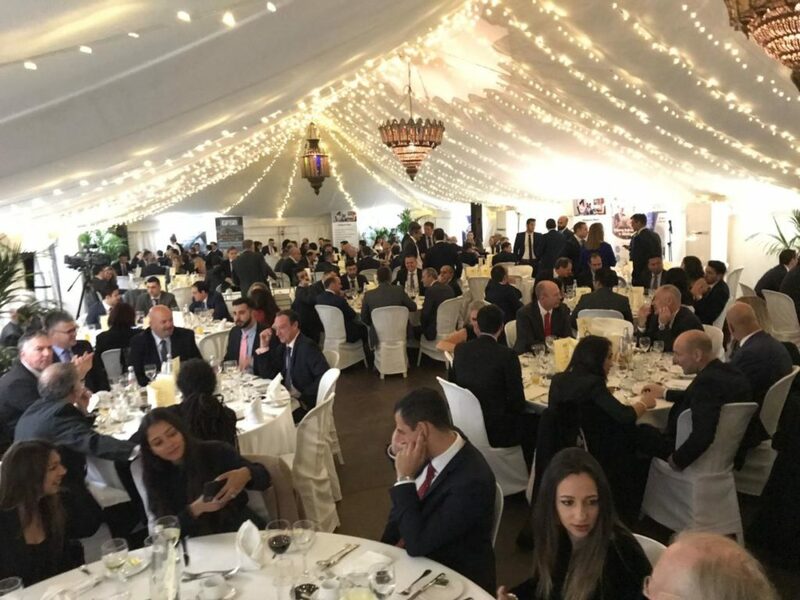 This was clearly not to be the case, and discussions around the dining tables as views were exchanged over food and wine pointed to the frustration and sense of powerlessness being experienced by many of Gibraltar’s businesses. “We can’t plan ahead,” a frustrated MD told me, “we have had to freeze expansion plans, but while we could do with bigger premises, we can’t take that risk just yet until we can assess properly how Brexit and its implications will affect both our trade, and our work force.” Several others expressed concerns about border fluidity for workers, which might be as affected by the changing political climate in Spain as it is by Brexit, while still others expressed scepticism as to the availability of supplies in the short term while new agreements on trade terms with the EU are established. Yet there still remained an air of optimism. Resilience in the face of adversity is a recognised feature of Gibraltar’s business community, alongside a thirst for innovation and creativity as evidenced by the Business Innovation Awards that also took part during the course of the evening. The Chief Minister made reference to the efforts and to the drive demonstrated by Gibraltar’s businesses. “We are stronger, growing and emerging as a successful Mediterranean common law jurisdiction,” Mr Picardo declared, pointing out that Gibraltar is in a better position in terms of employment and the economy than it was in 2016 when the referendum took place. He reiterated that Gibraltar is ready, after two or more years of intense work by Deputy Chief Minister, Dr Joseph Garcia and his team, to face the consequences of the possible scenarios that may emerge over the next few weeks as the UK Parliament continues to wrangle with itself on the terms of the Withdrawal Agreement: Gibraltar’s position, he noted, is as advantageous as it could possibly be. The Chief Minister’s address also tackled the issue of the recent Tax Treaty with Spain, an issue that has seem some controversy in the local media. Without going into the terribly dry detail of tax law, perhaps to the relief of most members present, Mr Picardo appeared to aim to allay some of the concerns that had been openly expressed in the past weeks. “No concessions,” he declared, “have been made on our sovereignty, jurisdiction and control.” No new taxes have been created, he continued, there has simply been a clarification of the situation and certain obligations of cooperation and transparency created for both Gibraltar and Spain. For Gibraltar, this has the benefit of receiving de jure recognition of its parliament and its laws by Spain, something that has not always been the case. The Treaty also creates an obligation from Spain to remove Gibraltar from its blacklist of tax havens, and should this not be the case – a point that was made to the Chief Minister when he invited questions from those attending – then there are provisions for Gibraltar to withdraw from its obligations in turn. The Chief Minister concluded his address by referring to work that the Government is carrying out with the GFSB to support businesses. This includes new draft regulations on business licences being prepared and ready, it was hoped, within a couple of months, and the creation of a Business Improvement District in order to improve Main Street and its offering. Mr Picardo thanked GFSB members for the support and backing that they have shown the Government throughout the Brexit process and the confidence in his team that has been shown. 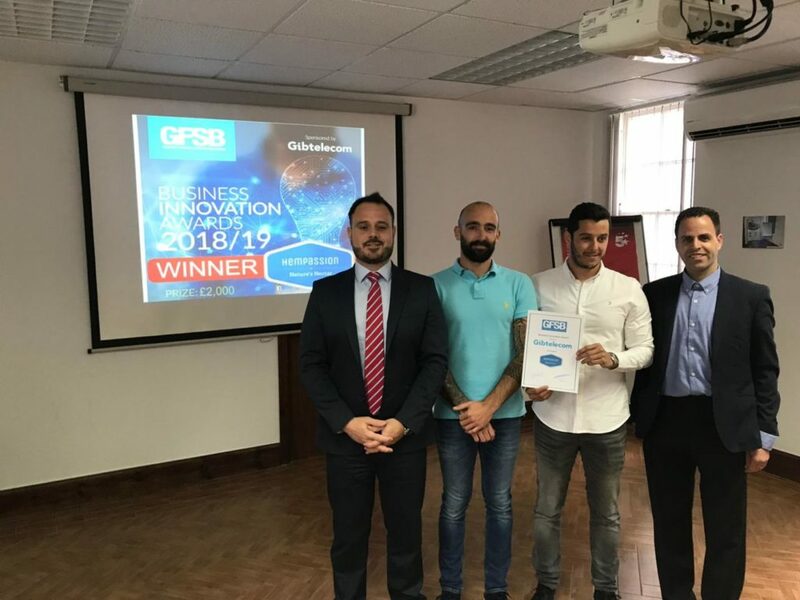 Later in the evening, the GFSB’s Business Innovation Award, sponsored by Gibtelecom, was presented. Won this year by Hempassion, the brainchild of David Martinez and Nathan Porro, this young company manufactures CBD oil products and exports them to several European countries. With international interest in CBD oil products increasing at pace, the growth potential of this business and the efforts made by the business to bring a new industry to Gibraltar impressed the judges. During his introduction to the Award winners, GFSB Board Member, Eran Shay, made reference to the fact that this year the Award has attracted more entrants than ever before. This resulted in there having to be a second round of interviews to further filter and shortlist finalists. 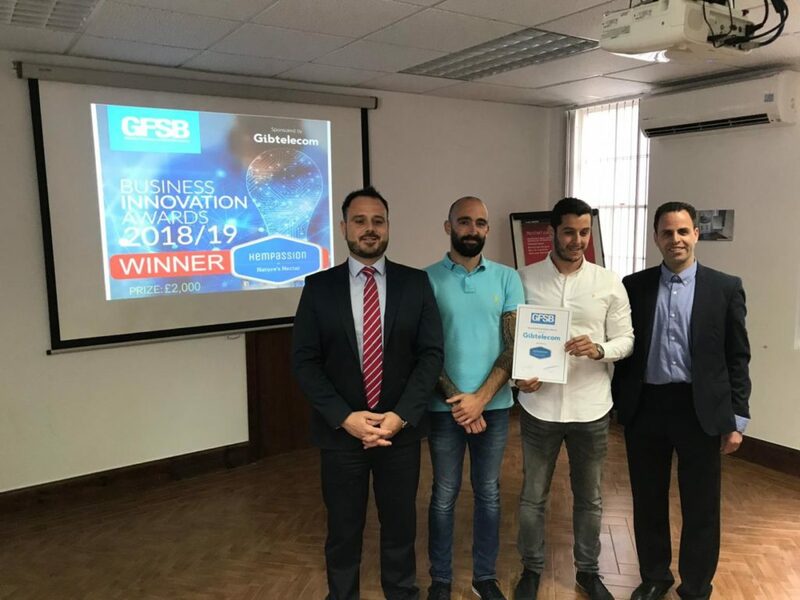 The quality of the businesses that entered the competition was another factor that challenged the judges, and it was noted that entrepreneurship, creativity and innovation are powerful features of Gibraltar’s community, something that both the GFSB and the Award sponsors, Gibtelecom, are delighted to support and encourage. While Brexit was an obvious topic of conversation during much of the evening – although it had petered out somewhat by the time the after dinner port was being served – the event also served to highlight some of the GFSB’s achievements of the past year and look ahead to some exciting new projects. In his welcome speech, GFSB Chairman, Julian Byrne made reference to the work that had been carried out by the GFSB to provide useful, practical support to members with initiatives and events such as the Main Street Review which has led to the preparation of a Business Improvement District for the improvement of Main Street; the ongoing and increasingly successful Breakfast Club seminars; the bi-annual speed networking events which had received great feedback from members and continuing training opportunities which benefits from government subsidies. Constantly seeking ways to help and support Gibraltar’s small businesses, Mr Byrne made mention of up and coming initiatives, including the development of a Small Business Manifesto to be prepared in anticipation of a general election later this year. He also made reference to the merging of Women in Business into the GFSB. Invited to address members, Brenda Cuby, from Women in Business then gave an overview of the organisation, looking ahead to working closely with the GFSB to help the business community achieve a better balance through equality, diversity and inclusion. The evening, as usual one of the year’s most successful opportunities for networking, concluded with a raffle, with prizes donated by GFSB members being awarded in a friendly, jovial atmosphere. Brexit, if not forgotten, was at least put aside for a while longer. Congratulations to Hempassion this years GFSB Business Innovation Award sponsored by Gibtelecom. 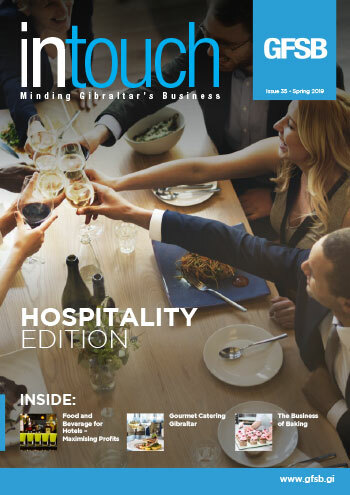 Read the latest issue or archived issues. We have been members of the GFSB for several years now and find it a valuable membership for our business. 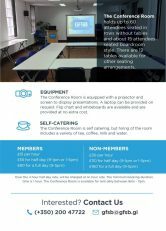 Getting to use the training room facilities and all that they provide there is a great help for us in our business. The admin team are always very friendly and helpful to us if we have any questions. We particularly like the regular breakfast meetings and the speed networking events which allow us to meet other members and learn valuable information. We have found the GFSB to be a very useful resource for obtaining local business advice, as well as networking opportunities. They have been instrumental in helping us to shape our business. The GFSB networking events are of tremendous value to our business development strategy, having opened doors and provided very interesting leads from local companies, who have in turn shown a strong demand for our services. They have helped us both grow and further promote our local business and services to a wider corporate audience.